Mary Debono is a Guild Certified Feldenkrais Practitionercm with a passion for improving the quality of life for animals and people. Having discovered the healing power that a heart felt connection with animals can produce, Mary created Debono Moves as a way for people to use this connection to generate well-being and vitality in both themselves and their animal companions. Useful for all ages and physical conditions, Debono Moves can help animals move more freely, minimize the effects of aging and injury, improve athletic performance and enhance communication and harmony between human and animal. 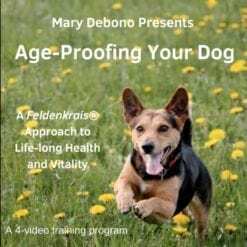 Age Proof Your Dog & Grow Young With Your Dog – Together! Buy Them Together and Save! Learn How You and Your Canine Companion Can Feel Better at Any Age!